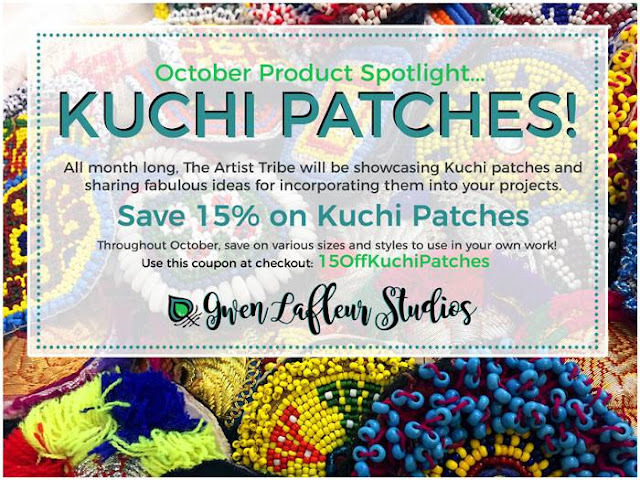 One of the many fun things about being part of Gwen Lafleur’s Artist Tribe is the monthly challenges. Gwen’s shop is so jam-packed full of great stuff it’s hard to choose what to work on. These challenges help me to focus. I’m liable to stop and chase shiny objects midway through a project, so this structure works well for me. Well, it’s not just great for me, but it’s also great for people who have a bit of hesitation because they can’t think of how to use a particular shiny item. 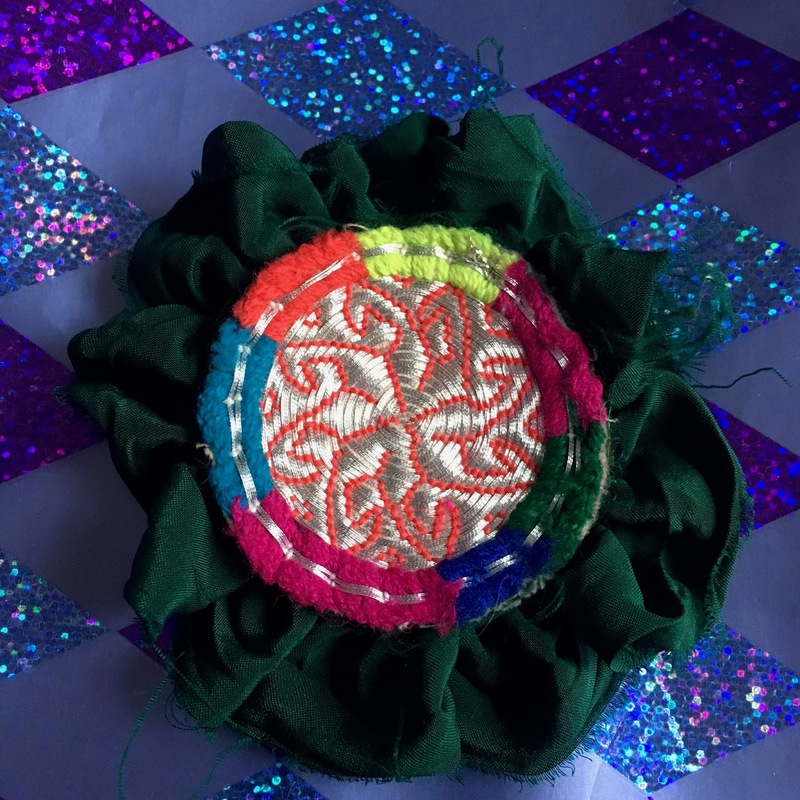 Peruse the Tribe’s offerings of the month and you will get inspiration and the itch to create. Like bonuses? (Who doesn’t?) There’s a discount coupon at the end of the post. 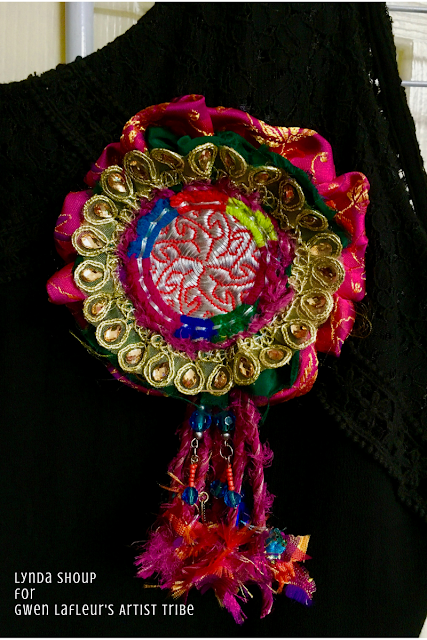 This month the challenge was to use her kuchis from Afganistan. Here is my project and some information about my process. I got so wrapped up in the process I forgot to take pictures at each step. 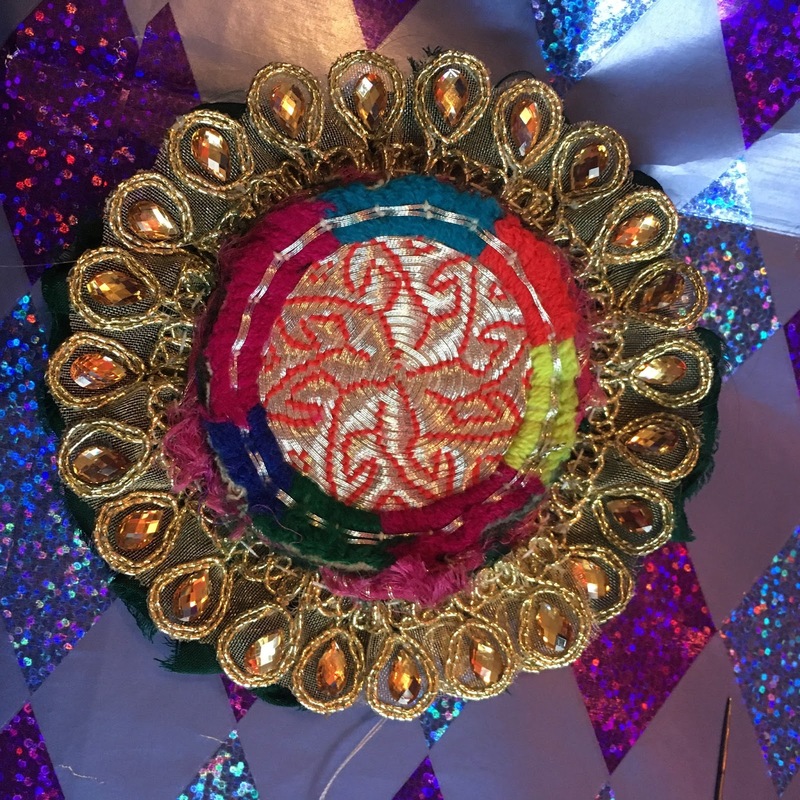 Who wouldn’t make the connection between this piece of silk that’s been in my stash for near 10 years and this beautiful kuchi? 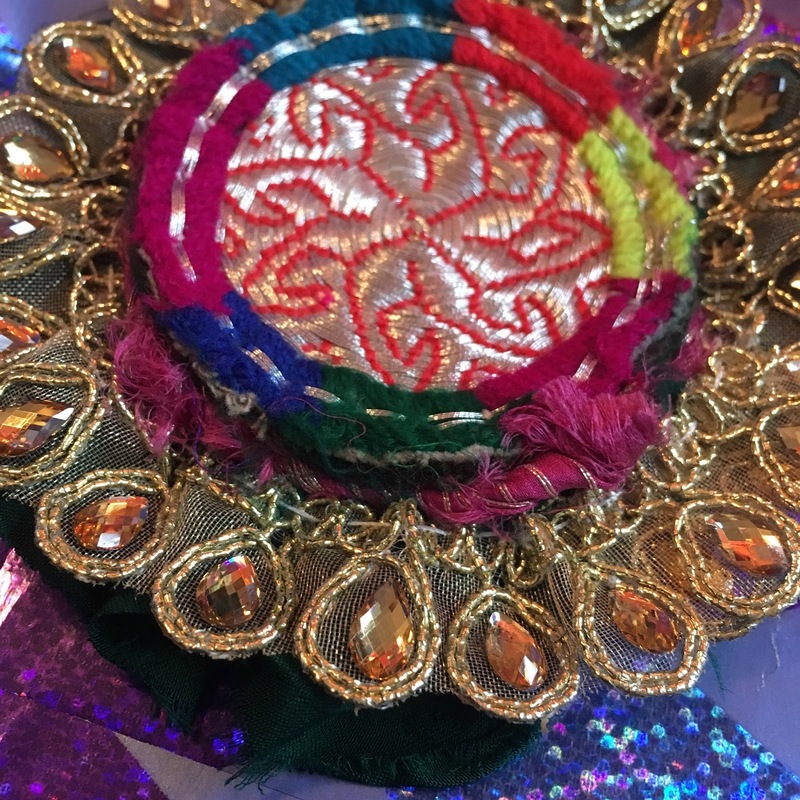 This gold trim from the Irresistible India Happy Pack in Gwen’s shop and I love the way it works with the gold thread. 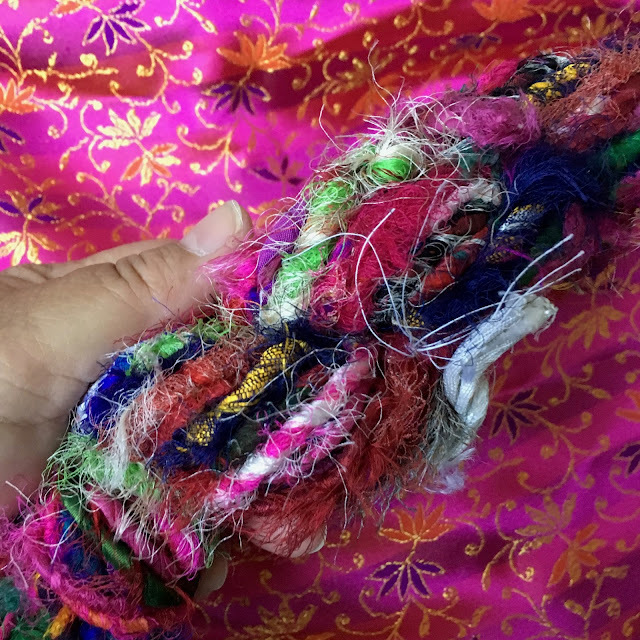 Then there is this – beautiful sari yarn from Darn Good Yarn. The colors! So luscious! Knew that this sari yarn would have to be stitched around the edge of the kuchi. 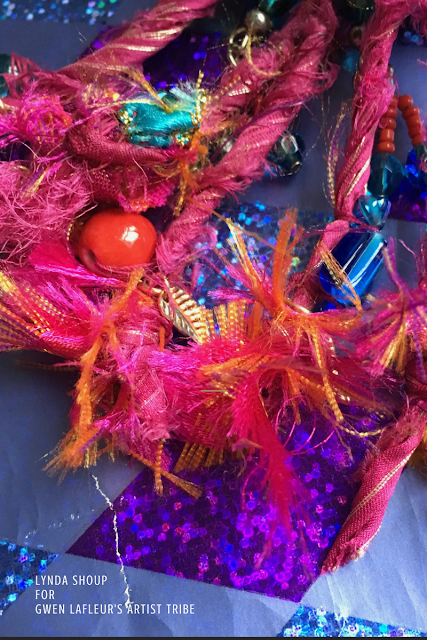 But before I used that great Twisted Sister sari yarn, I thought the green sari ribbon that was in my welcome pack would be a great background. 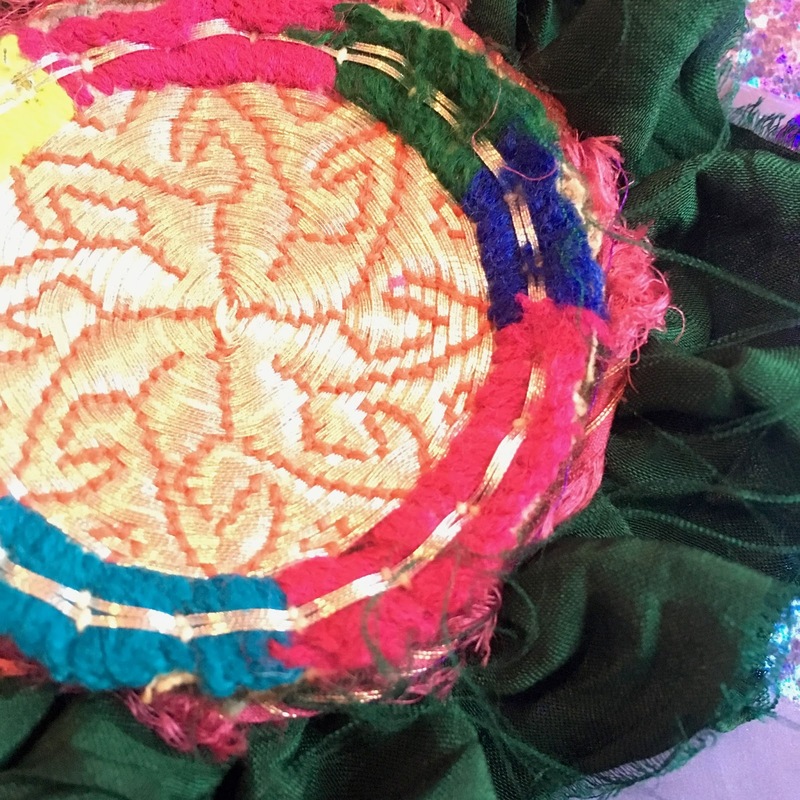 A running stitch along the edge, a pulled to make a ruffle and roughly stitched to the back of the kuchi made for a strong base. 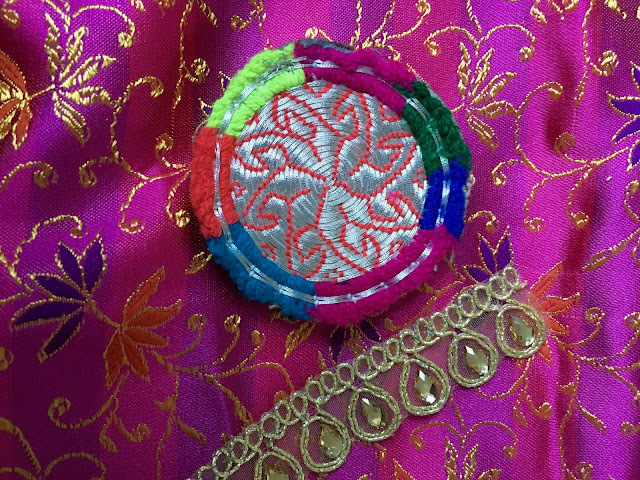 Next, the Twisted Sister sari yarn was stitched into the green sari yarn along the edge of the kuchi. 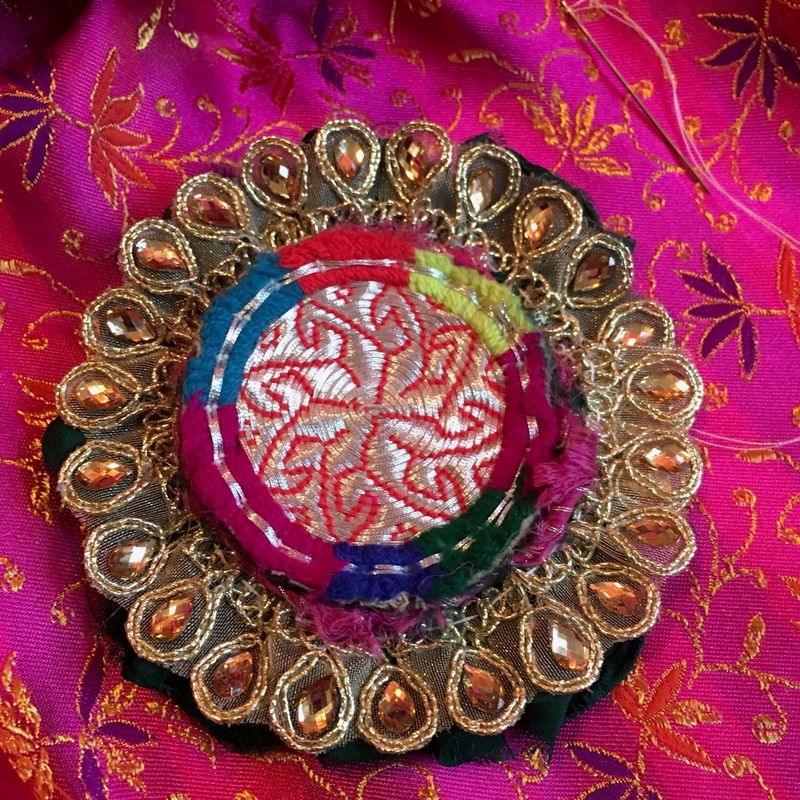 Later I found it disappeared into the fabric, so I ended up stitching it again to upper edge of the kuchi. It was much more visible this way. 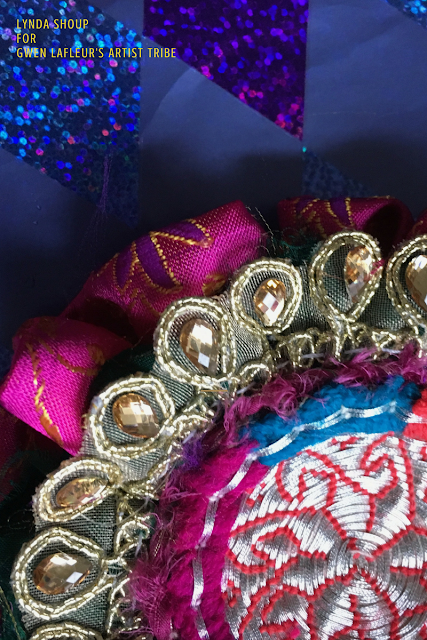 Next the gold trim was gathered and sewn to the green sari yarn. Next I wrapped some of that Twisted Sister sari yarn around my hand and tacked it together with thread. By cutting the bottom I made tassels of sorts. Remember that silk fabric? I cut some and tied it in a knot at the end of each strand. 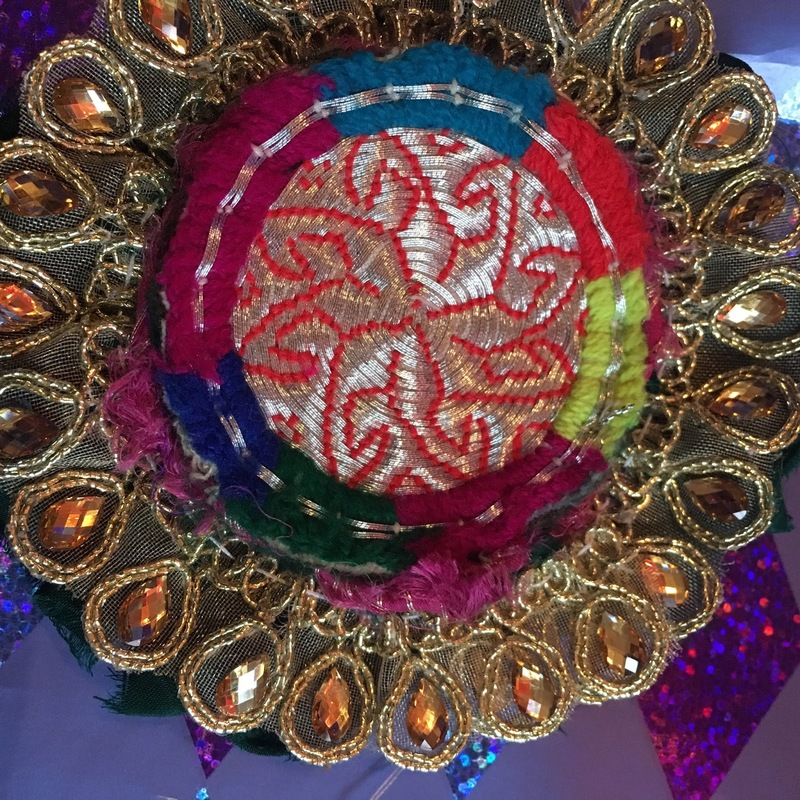 Beads were added and the whole was stitched to the back of the kuchi. Cutting a strip of silk for one more round of ruffle made it very apparent that silk frays. A quick zigzag around the edge helped to stop the strands from flying away. Then the two edges were sewn together, drawn into a ruffle and sewn to the backside of the kuchi. Finally, a circle of felt was sewn to the back to cover all the stitching and errant threads and a pin backing was tacked in place. Viola! 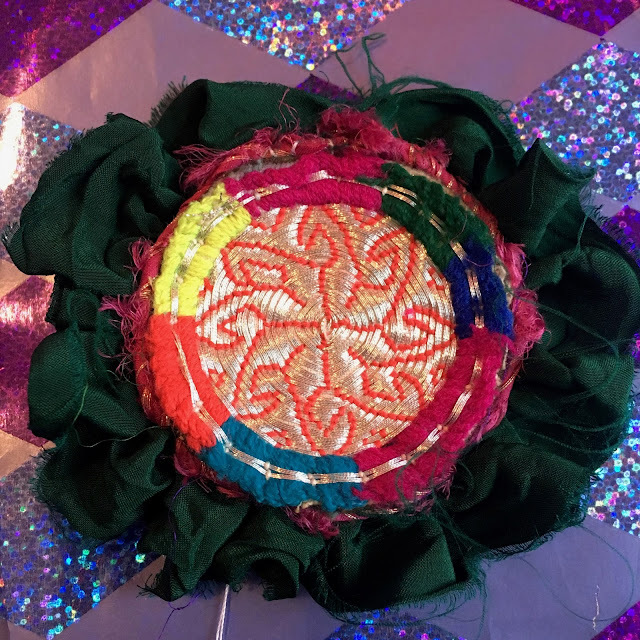 A pin to wear to cheer up dreary days. 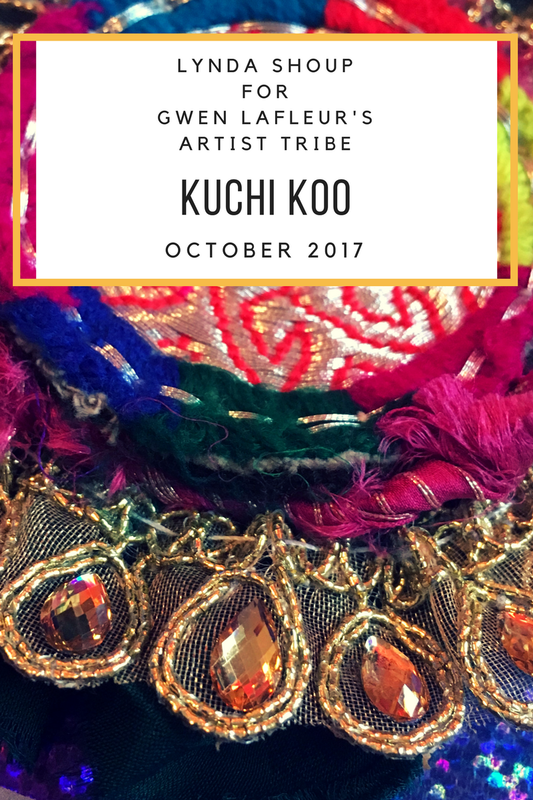 I hope I have tickled your fancy with my Kuchi-Koo. Find yourself thirsting for a kuchi? Well, my friend, you have come to the right place. Gwen is having a sale. Loads of color and lots of fun, Linda. I can tell you are enjoying this! I love this Lynda! 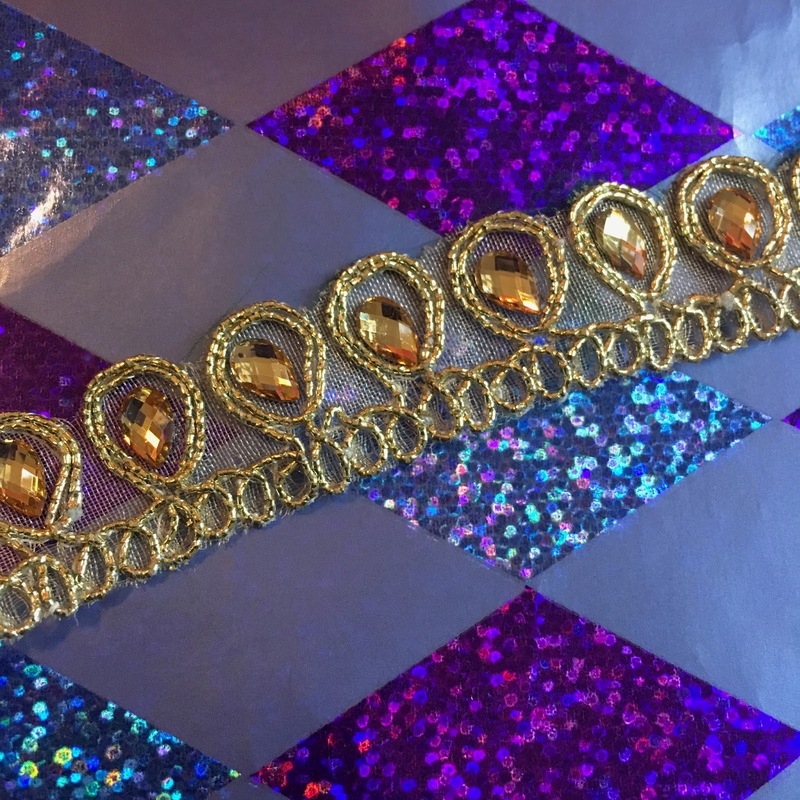 It really worked perfectly with that silk in your stash, and I love how you used the Twisted Sister yarn too! This turned out beautiful, and it was fun to see your process! Thank you! Thanks, Jeanie. We are definitely having a blast. This is one of the funnest things ever. Glad you took a look. Thank you, Gwen! It is easy to create when you have such lovely materials to work with! Thanks, Sandee! It was fun to make. Thank, Michele! I'm glad you like it. It was fun to make.